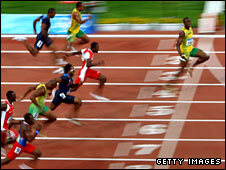 Jamaican Usain Bolt left his rivals trailing to win gold in the Olympic 100m final with a new world record. Bolt was well clear at 60m and although he eased down and started to celebrate 15 metres from the line, he still set a new mark of 9.69 seconds. Richard Thompson of Trinidad and Tobago was second while American Walter Dix came third but they were well adrift. "My one aim was just to be a champion. That is what I came here to do," said the 21-year-old Bolt. "I told you I was going to be number one and I did just that. I got a great start. I was getting good starts all the way up to the final. I was getting better and better. "It was crazy - phenomenal." Bolt, who becomes Jamaica's first men's 100m Olympic champion, insisted his decision to celebrate even before crossing the line was not designed to be disrespectful. "I wasn't bragging," he said. "When I thought I had the field covered I was celebrating. I was happy." As for setting a new world record, he added: "I didn't know I'd broken it until my victory lap. "When I ran the earlier round I felt the world record was possible because it's a new track, it's fast. But I came out here just to win. "I am just happy I did the country proud. I am Jamaica's first gold medallist, and I know the whole of Jamaica is going crazy." Bolt, who was in two minds about running the 100m until just a few weeks ago, took a call from Jamaica's prime minister Bruce Golding following his race. "He said 'Congratulations' (and that) I had made the country proud and they are looking forward to me going home. "I am looking forward to going home also. I did the country proud and that was the aim for me." Bolt's Jamaican team-mate Asafa Powell had been tipped as a possible rival but finished in fifth place. Powell told BBC Sport: "I messed up big time, my legs died on me. Usain ran an awesome race, I'm very happy for him. "I'm not sure what happened, I just have to be happy for Usain. It's a sad time for me, I really wanted to get that gold medal. But it's quite obvious I wasn't ready for the big stage yet." Second-placed Thompson posted a time of 9.89 seconds while Dix was two-hundredths of a second back in third as six men broke the 10-second barrier. "Words cannot describe how I feel right now, this is just a dream come true for me," Thompson told BBC Sport. "I have to tip my hat to Usain Bolt, he's a great competitor, a phenomenal athlete, and there was no way anyone was going to beat him with a run like that. "But it just feels good to come in here, run in the Olympic Games, my first Olympic Games, and win a silver medal and run a personal best at the same time. I couldn't ask for anything more, thank God." Earlier this year, Bolt set a new world record of 9.72 seconds to take the record away from Powell, and the 21-year-old had looked in imperious form on his way to the final, which world champion Tyson Gay failed to qualify for. Powell had also looked in fine form but from the gun it was clear there was only going to be one winner. The only question was just how fast a time Bolt was going to set. "I never knew I was going to run so fast," said the 6ft 5in star. "I didn't come here to break the world record - because I am the world-record holder." 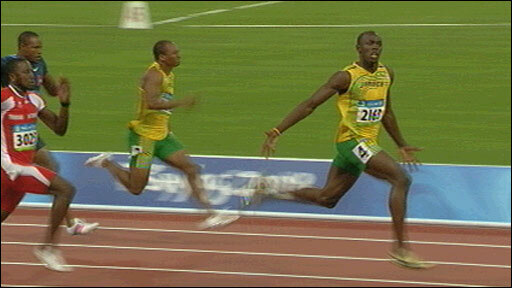 Bolt believes he can go even faster, saying: "Anything is possible. The human body is changing so you never know." Despite easing down well short of the line, Bolt took three-hundredths of a second off his previous record in a display American legend Michael Johnson described as "the greatest 100m performance in the history of the event". 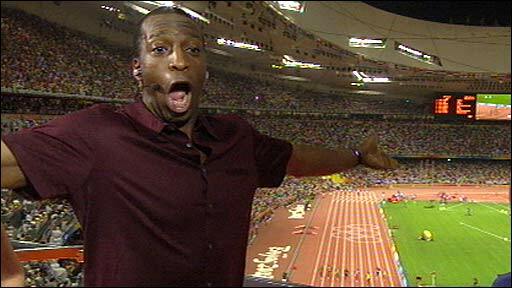 Johnson, a multiple Olympic champion who still holds the 200m and 400m world records, told BBC Sport: "He shut down with 10m to go. We have never seen anything like it before. "It's absolutely amazing. Asafa Powell and Tyson Gay cannot run with him. He is a show unto himself." Bolt will now try to become the first man to complete the 100m-200m double since Carl Lewis at the Los Angeles Olympics in 1984. He will also target gold in the 4x100m relay. "I have one aim now and that is to be a triple gold medallist," said Bolt, who will be back in action on Monday for the 200m heats.